Last night, in an inspired fit of brilliance, I accidentally permanently deleted the photos of the lunch I had in Menotti that I had uploaded from my camera. While I was uploading them I also deleted from my camera, which means I have no pictures from Menotti to accompany my post. You, my adoring masses, shall just have to use your imagination. I'd heard of Menotti from Keith, who told me about a charming Italian cafe in Raffles City run by the same people who run Garibaldi (Menotti is in fact, Garibaldi's son), which served very affordable set lunches and dinners. Not really knowing if the food was good, I searched for other reviews of Menotti, and lo and behold, who do I find has already reviewed the place but the delightful Cheryl of She Bakes and She Cooks. With her endorsement, I was pretty confident that the place would turn out to be good. Menotti is situated by the boardwalk, opposite the Raffles Hotel, so there's an excellent view if you sit by the window. 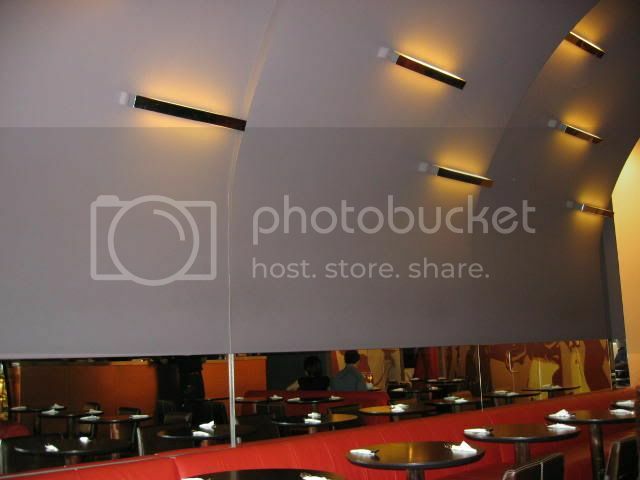 The ambience is slick, looking almost like the Starship Enterprise. This seems to appeal to all the office types, as Menotti fills up quickly, so go early for lunch if you can. Service is sufficient, if a little inconsistent. I don't really like the fact that the place charges for water, which I think is in poor taste. Food arrives promptly though, which is always a good thing for you busy people out there. I really enjoyed their classic Italian hot chocolate ($6.50) which is melted chocolate in a mug, into which you pour heated milk in desired quantities. The feeling of drinking rich chocolate adulterated only by milk is quite extraordinary, and you can well imagine why chocolate is the panacea in the Harry Potter books. Menotti serves fairly casual pastas and bistro-ish food, but none of which seemed very spectacular to me. In the end I settled for a lasagna ($15), which came with a generous helping of cheese, and was very filling. 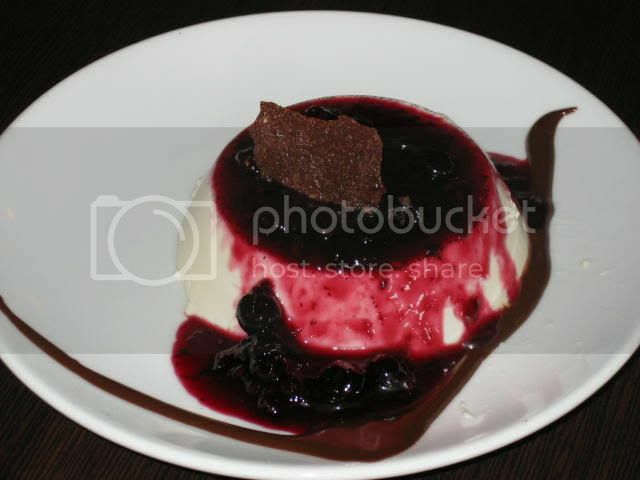 Dessert was supposed to have been panna cotta, as I'm still searching for the perfect panna cotta in Singapore. [Ed: Menotti's offering wasn't that fantastic; a little too much gelatin which made it a little too dense, and the raspberry compote was very tart.] Unfortunately, they had run out, so I had to settle for a "Morbida" Chocolate Mousse ($7), which despite the unsettling name, was actually pretty good. However, it was a bit too dense for my tastes, and as I was pressed for time, I didn't manage to finish it. While Menotti's set lunch and dinner are extremely reasonably priced at $20 and $30, there isn't much to choose from, as they exclude an appetiser course, and the mains are rather selective. Upper Club is a new swanky dinner and dance place that's opened at Chjimes, and was reviewed, in short order, by just about all the newspapers in town. I was curious to see how well a dinner and dance joint would do in this city, considering ballroom dancers form a noticeable minority of the dining crowd. Unfortunately, I'd been prevented by various commitments from having dinner there, until tonight. I was looking forward to going, since it's been a while since my last D and D, and it wasn't till we were almost there that I discovered a massive oversight had led to my forgetting to bring along my dance shoes. So much for a night of dancing. Service started well, with the waiters serving the ladies first, but deteriorated progressively as dinner went on. They started mixing up orders, and the food arrived at a rate even a snail would have been ashamed of. Located in Chjimes, this can be kind of a pain. On the one hand, it's accessible from the Raffles City MRT, but if you're driving, parking can be a real hassle, especially if there's a wedding going on. 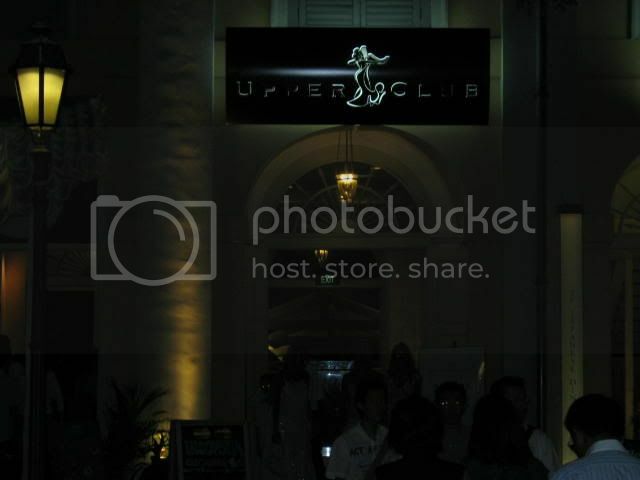 In terms of ambience, Upper Club isn't like most other restaurants. 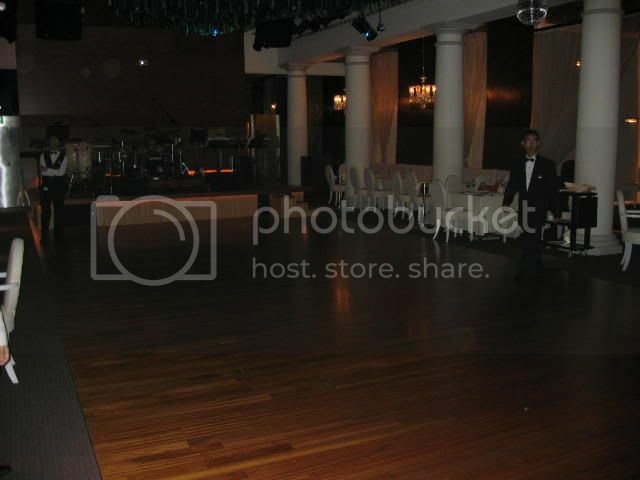 The dance floor is much longer than it is wide, which can be slightly inconvenient. A live band provides the music; however, they have a tendency to sing much too loudly, resulting in a chronic disability to hear yourself think. They also have an irritating habit of singing Chinese songs, which are diverting for a few minutes, before seriously getting on your nerves. 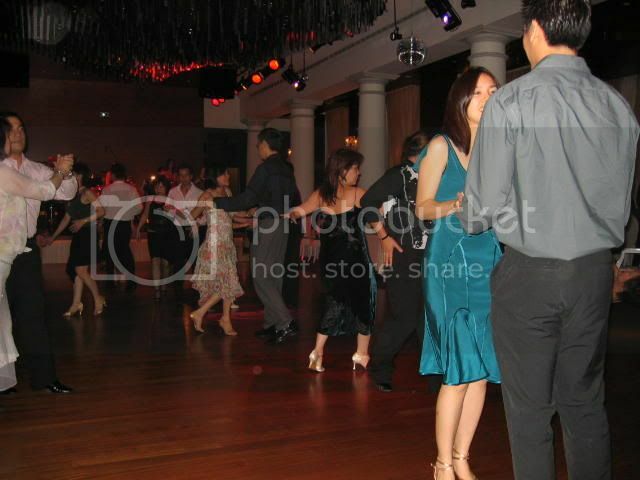 The band also tends to play lots of rumba and cha cha music, which alienates the ballroom dancers, but I suppose that's a good thing if you're into latin. Anyway, with regard to food, there are two menus to choose from: a five course set dinner ($68) and an a la carte menu. 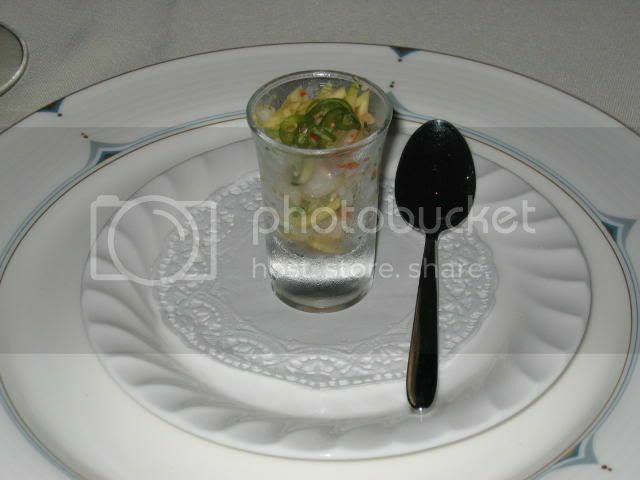 Either way, you're provided an amuse bouche of salad, which is quite possibly one of the worst things they could have put in a shot glass (1/5). Truly, after tasting this, I sincerely hoped that the rest of the food was going to improve. 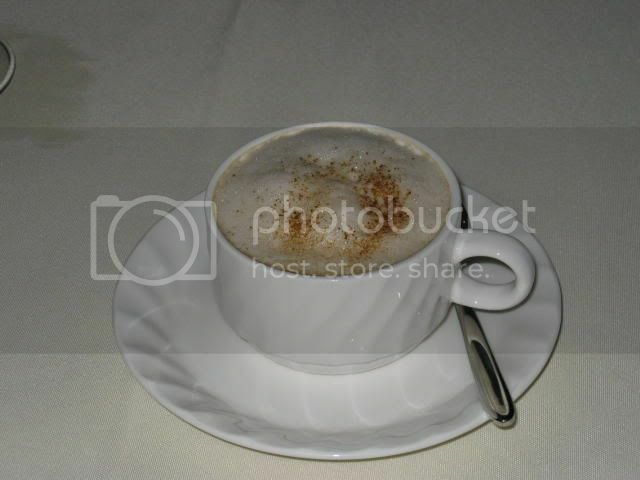 Thankfully, the next course was a Mushroom Cappuccino of cepes mushrooms and topped with hazlenut foam ($12), which was a lot better than the disastrous amuse, but without being spectacular (3/5). There was a strange aftertaste in the soup which I attribute to the truffle oil, and the foam was rather ordinary, with only a light dusting of hazlenut. By which time, the room was filling up with couples burning the floor (or in some cases, warming). Many of these ladies don't bother with the food at all, choosing instead to dance the night away. Unfortunately, the fact that I forgot my shoes, and that the band was playing more latin than ballroom, meant that I could only watch rather than participate. 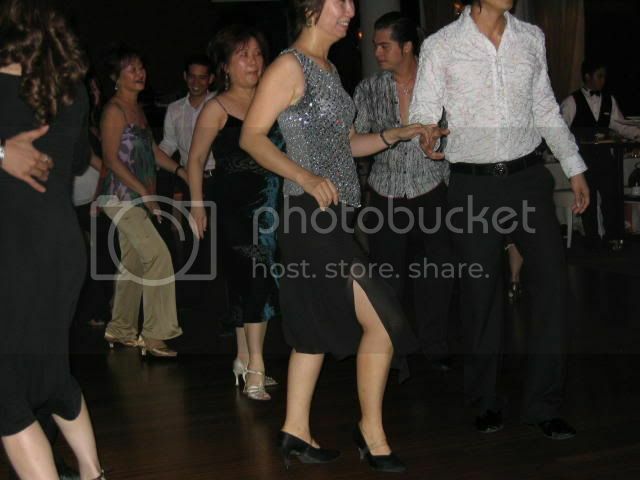 Not that it was unenjoyable; my sister and I made many humourous observations of the Personal (Philippino) Dance Instructors. We agreed they'd make a wonderful subject for an arthouse movie. 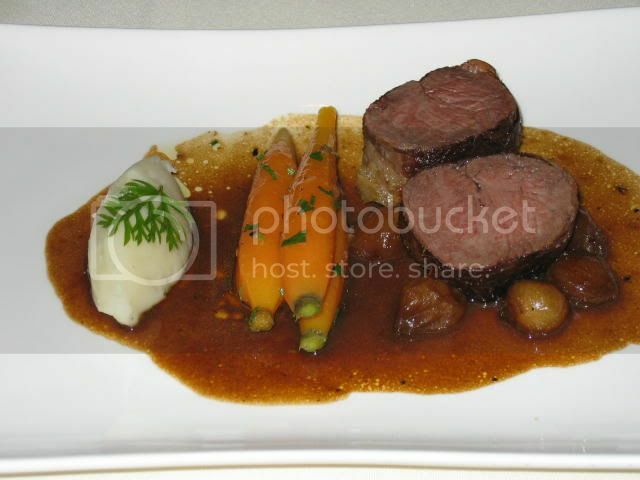 The main course was a beef tenderloin wrapped in prosciutto, served with baby carrots and shallot jus ($36). Now this was terribly disappointing - the portion was tiny and the meat was dry and overcooked (2/5). This probably explains why everyone was busy dancing and not eating. It was generally agreed that the main courses were rather abysmal, so it wasn't just me. They were, as a matter of fact, doing a coordinated cha cha. 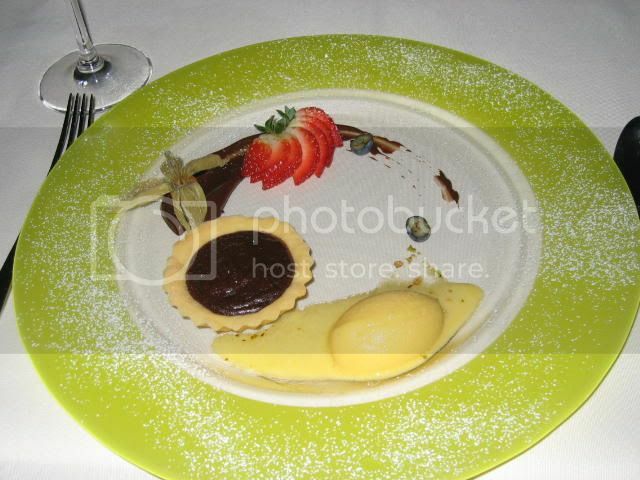 Dessert took the form of a bete noir chocolate tart with passionfruit sorbet ($10). Again, this was pretty bad (2/5). I'm generally very forgiving towards chocolate, but the tart pastry was thick and dry, and the passionfruit sorbet was exceedingly sour. Oh yeah, and the tart was really miniscule.